Sir Norman Lockyer was one of the first modern Europeans to identify the presence of an underlying geometry connecting the alignments of ancient sites. The ancient landscape was a canvas upon which in prehistory, our ancestors connected points on the ground with points in the sky, then further reinforcing these connections with megalithic constructions. Although simplistic, this is the essence of the ley-line theory, which is still not fully accepted by the scientific community. The suggestion of a further geometric connection between these alignments has always been a bone of contention for mainstream pre-historians, who still argue that Neolithic people were simple tribal, hunter/gatherers, with only basic skills, and as yet not identifying any presence of any order or hierarchy in their society, which might facilitate the existence of such grand architecture. The equilateral triangle at Stonehenge which was recognised by Sir Norman Lockyer serves as an excellent means whereby many of the answers to these questions can be found through the same example. The marker points for the Stonehenge triangle are: Stonehenge (Circle, Henge), Grovely castle (Grove-ley), Old Sarum (Mound, Circle, Henge). All classic Watkinsian markers. Further more, each side extends beyond the triangle, crossing more classic Watkinsian markers. A fundamental component in the Stonehenge-Grovely alignment is that it is oriented along the azimuth of the mid-summer solstice sun. This same alignment is continued physically in the shape of the 'Avenue' at Stonehenge. The astronomical significance of the specific location of Stonehenge is also seen in terms of latitude, as it was built under the exact azimuth of the maximum northerly setting for the moon over its 18.6 year cycle. The alignment extends to the North-East beyond St Peters mound, Inkpen beacon, and the Neolithic 'Winterbourne camp'. To the South-West the line continues past Grovely Castle, Castle ditches and the 'Cerne-Abbas' giant to Puncknowle beacon on the South coast. The Stonehenge - Old Sarum line continues on to Avebury (Silbury Hill), and can be considered to be at least of the same age, as both Avebury and Old Sarum are dated at 3,000 BC (6). Watkins believed that ley-lines terminated with a beacon point which Silbury Hill and Old Sarum are both classic examples. The Stonehenge-Old Sarum line is continued another 6 miles to the site of the present Salisbury Cathedral, then the 'Clearbury rings' and 'Frankenbury'. The last side of the triangle, from Grovely Castle to Old Sarum however, shows little, if any significant extension in either direction. The fact that both lie at the same distance from Stonehenge, might better be explained by the actual distance between Grovely castle and Old Sarum, as both of these locations are natural outcrops protruding from the surrounding landscape, which raises the interesting possibility that it was the distance between these two landscape features which played a part in determining the ultimate location of Stonehenge. Although there is a huge range of dates for these markers, (i.e. we know that Grovely castle has Neolithic provenance (8), and that the major earth-works at Stonehenge began at around 3,100 BC (5) it is possible to identify at least another 3 sites along the Stonehenge - Grovely castle line that have Neolithic provenance, offering a reasonable indication that the origin of this line in particular can be dated to at least 3,000 BC. 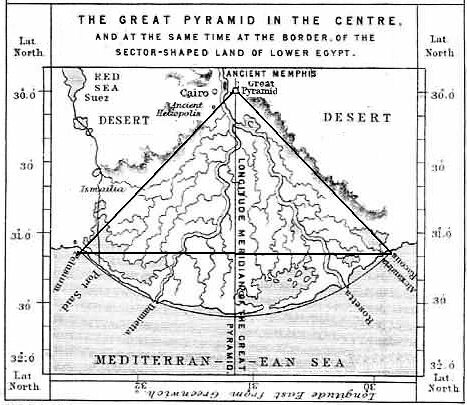 Lockyer pioneered the field of archaeo-astronomy, and spent some a time in Egypt, where he investigated the alignments and orientations of many ancient structures. He was able to combine his astronomical knowledge with observations at certain temples, and produce dates that he confirmed through examples of temples with re-aligned axis. His researches led him to conclude dates of 4,000 BC for early dynastic structures (3). William Black - In the 1800's, an expert on roman roads called William Black, announced his theory that he had uncovered a whole system of ‘grand geometric lines’, radial and polygonal, which ran across Britain and beyond. He pursued his studies for fifty years before releasing the theory. They linked major landmarks in a precise manner, even defining the boundary markers of counties. Black died in 1872. (Ref: Sacred geometry). Note: A number of locations (i.e. Normandy/Brittany, Ireland, France/Italy etc), still have dominant megaliths that seem to define borders. When the boundary-line between Normandy and Brittany in France was established, The pre-existing standing stone 'Dol-de-Breton' became a natural boundary marker. Several ancient county borders in England also used pre-existing megaliths to define their boundaries. The Geometric alignments of standing stones Mid-Clythe, Caithness. (After A. Thom). France was the home to a detective called Xavier Guichard, who in the early 20th century, while investigating the ancient roots of place names, discovered a prehistoric network of alignments extending throughout France (and other areas of Europe). These alignments were connected by locations with the name Alaise. He also concluded that he had touched upon the Eluesian mysteries of ancient Greece. Guichard's research uncovered two giant 'Rose des Vents', one of which was divided 24 times and had no astronomic significance, and the other one orientated towards the rising and setting points of the equinoxial sun. The underlying geometry suggests a division of the circle into units divisible by 24, (suggesting the use of a 360° circle), in addition to which, all of the several hundred 'alaisian' locations were seperated by units of exactly one degree of either longitude or latitude (also based on a 360° circle). his strongly suggests the awareness of longitude and latitude. The implications of such a large-scale practical display of geometric alignments forces an investigation of his claims. It is noticeable that Guichard reached similar conclusions over the purpose of certain routes, and determined the same root-name (Alaise-Leys), his work was entirely independent of his contemporary researcher in England, Alfred Watkins who's work on 'Ley-lines' appeared to confirm that such practices had existed in Britain too. Livvio Stecchini - Suggested that the ancient oracle centres were placed according to geodetic principles at which 'Omphalus' or 'Navel stones' were placed. 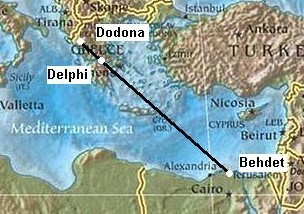 This idea is supported by the historical narratives of Herodotus, who wrote that the oracle centre of Amon in Libya was founded by flying doves from Thebes, which was long considered the geodetic centre of ancient Egypt, is located 2/7ths of distance from the equator and the north pole, and at which an Omphalus was later discovered. Herodotus also wrote that the oracle centre at Dodona was said to have been founded by Egyptian priestesses from Thebes and that doves flew between the two sites. Dodona was believed by the Greeks to have been the resting place of the ark, and it is interesting to note that two doves are often associated with Omphalus. 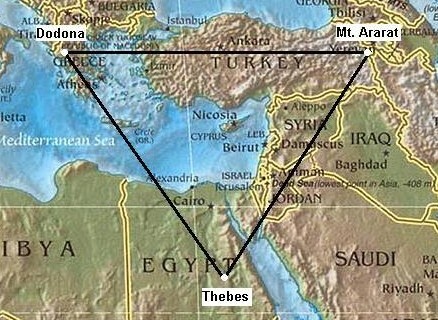 The Hebrews believe that the final resting place of the ark was at Mount Ararat in Turkey, which is on the exact same latitude as Dodona, and the three form an equilateral triangle. John Michell Began by researching stone circles in Cornwall, through which he began to recognise a the presence of common units of measurement, and geometric connections between megalithic sites. First brought to the public attention the existence of the now famous 'St Michaels' ley-line and also revealed in ‘City of revelation’, the existence of a large scale geometric figure 'The Decagon' across southern Britain. The ancient Celtic ‘perpetual choirs’ at Llantwit manor, Glastonbury Abbey and Stonehenge were shown to be 'three vertices of a regular decagon of majestic proportions. A fourth vertex exists at Goring-on Thames where a major pagan temple once stood at the junction of several important track ways'. The centre of the decagon is at the apparently insignificant hamlet of Whiteleaved Oak where the former counties of Hereford, Gloucester and Worcester came together. This decagon is related by angle and distance to the other geomantic centres of Britain. Note: Michael Behrend supported Michell's original concept but made two small changes to the original scheme. At present, no more than three vortices can be shown have a substantial enough accuracy and significance, although their distance and angle from each other certainly appears to be accurate enough to suggest the possibility of a deliberate, rather than incidental placement. 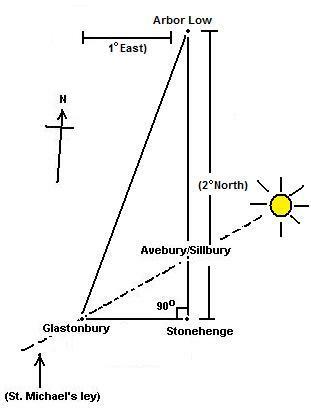 The discovery of a geometric relationship between Glastonbury and Stonehenge inot unique. 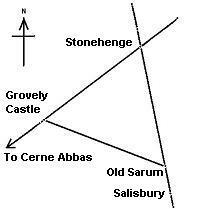 The two sites are also associated with several other ancient structures in Britain (such as the right-angled triangle formed with the inclusion of Avebury/Silbury (Arbor Low). The strong astronomic and sacred nature of these sites is reminiscent of Lockyer's earlier theories concerning the alignment of such sites, and it is tempting to conclude that such factors resulted in a geometric relationship. However, such a synthesis by no means precludes the idea that geometry itself was the original factor that determined the location of the sites. It is therefore interesting to note that the 'Decagon' is centred on the border of three counties (Whiteleaved Oak), which (apart from the 'sacred' name), has no reference to either astronomy or religion. Chris Street - (http://earthstars.co.uk) - Revealed in his book 'Earthstars', the existence of a series of underlying geometric alignments connecting London's ancient landmarks, and even extending beyond. Significantly, many of the sites identified combine to produce two concentric circles that surround London. 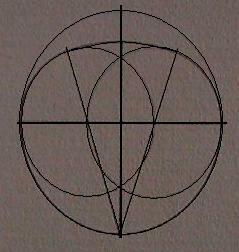 The proportions of these circles are the same as those found in the geometric pattern described as the sacred proportions for the city of 'New Jerusalem', the 'holy city of revelations' (as decreed by St. John). It is also interesting that the same geometric pattern is repeated in the ground-plan for Stonehenge, which has numerous other geometric associations itself. The observation of the same pattern at both sites is compounded by the fact that it is the same one produced by 'squaring the circle' in sacred geometry, which results in the proportion otherwise known as the 'sacred mean', as seen throughout nature, (such as the relationship between the distances and dimensions of the Earth and the Moon). Livvio Stecchini suggested that the many of the ancient oracle sites were placed according to geodetic principles. A suggestion which implies a working knowledge of longitude and latitude. 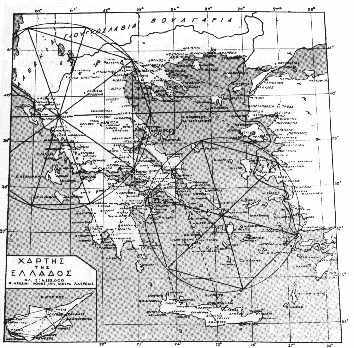 A milestone of literature on the subject of the geodetic placement of oracle centres already exists, written by Livio Stecchini (22), who concluded that several ancient oracle centres in the Mediterranean and Middle-east, were deliberately placed along specific latitudes and separated by units of 1°, which he suggested composed an 'oracle octave', along which the seven major centres were placed, each devoted to one of the seven known planets and symbolised by different sacred trees (for more on this subject refer to the 'Tree alphabet' in R. Greave's book, 'The White Goddess'). Underlying this geodetic placement, he believed was a set of knowledge that that formed the basis of the 'Eleusian mysteries'. The connection between 'sacred' Egyptian sites and the Greek oracle centres is supported by mythology. Herodotus wrote that the Oracle centre of Dodona was established from Egyptian Thebes (Karnak). As well as the fact that both Dodona and Ararat (Metsamor), lie on the same latitude and are both equidistant from Thebes, they are both also reputed to have been landing places after the great Flood events. There have been several suggestions of geometry between ancient Egyptian sites. Important Egyptian temples were placed according to geodetic principles, which demonstrate a clear knowledge of a spherical world at the same time as showing that the Egyptians used the same Babylonian and Sumerian system of a division of 360°. It can be seen that Giza, Alexandria and Behdet (The ancient capital), form a triangle with an angle of 51° 51' (The same as the Great pyramid and the angle of summer solstice sunrise at Stonehenge) The distance between them, and therefore the eastern and western borders of ancient Egypt was 1° 09', the same as the distance between the Greenwich and Paris meridians. 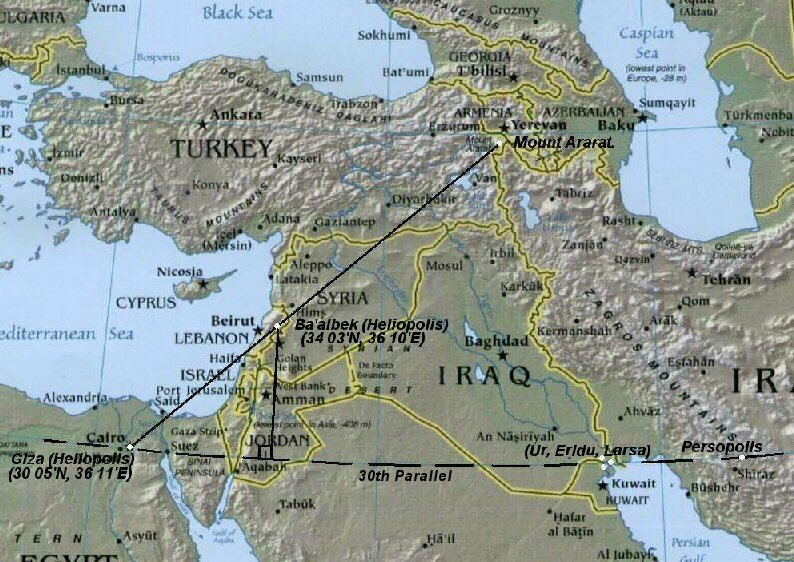 The placement of Giza (Heliopolis) along the 30th parallel (along with other sacred sites such as Persopolis, Sumerian Larsa and Tibetan Lhasa at 60° east of Giza), demonstrates a recognition of geometry and is a clear example of deliberate placement of ancient sacred sites. 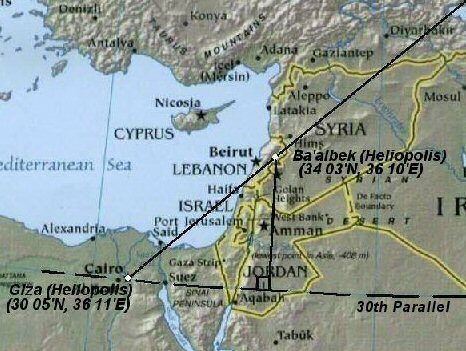 It can also be seen that the early dynasty Egyptian pyramids were orientated towards Heliopolis (Click here for more), it is therefore relevant in relation to this that Giza (Heliopolis), is almost exactly 4° west and 5° south of Heliopolis (Ba'albek), in Lebanon, creating an angle of 45°. The division of 21° 36' (3 x 7° 12') between Giza and Persopolis is said by Stecchini to be due to the following expression ((7° 12’ x 5 = 36°) x 10 = 360°). This is the same distance that defines the Northern and Southernmost limits of ancient Egypt (i.e. first Cataract 24° 00' to Behdet, Alexandria 31° 12'). Nimrud, the Assyrian religious capital (875BC), was placed almost exactly 6° North and 12° East of Giza. Nimrud - (36° 06’ N, 43° 20’ E). 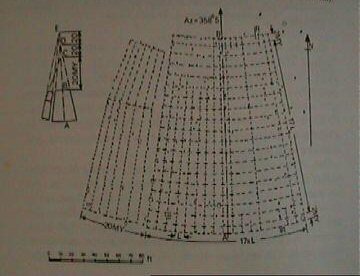 As well as being exactly 6° North of the Giza complex, Nimrud shares another remarkable mathematical parallel to another Egyptian feature, which is that the longitude of Nimrud is the exact same angle as that used for the exterior of both of Snoferu’s pyramids (43° 20' / 22'). This is not an isolated coincidence, but rather one which can also be seen at Silbury hill, England, which not only sits on the same latitude (51° 24.8' N) as the exterior of Menkaure's pyramid, but simultaneously reproduces the latitude of Giza in its own exterior angle of 30° and marks the point 4/7th's the distance from the equator to the North pole. When viewed in consideration of the placement of Karnak at 2/7th's and Delphi at 3/7th's, the placement of these significant ancient sites appears to suggest a larger pattern of deliberate placement. Examples of Large-scale Geometric Alignments. 2). C. E. Street. Earthstars. 1990. Hermitage Publ. 3). J. N. Lockyer. The Dawn of Astronomy. 1964. M.I.T Press. 4). J. Cope. The Modern Antiquarian. 1998. HarperCollins Publ. 5). A. Burl. The Stone Circles of the British Isles. Yale. 7). Th. Manias "Ta Agnosta Megaloyrgimata Ton Arhaion Hellinon". 22). Robert Temple. The Sirius mystery. (Appendix by Livvio Stecchini).